Avalanche pro litening lite wate pro aluminum, 1 1/4in aluminum handle. 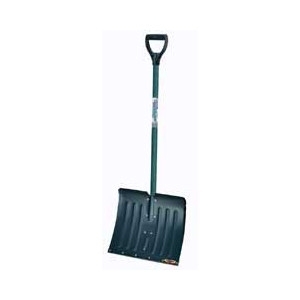 Ames True Temper Arctic Blast 18in snow shovel with wear strip. 14-1/2in x 18in blade. 49-1/2 in. length. Green stained wood handle with green blade. 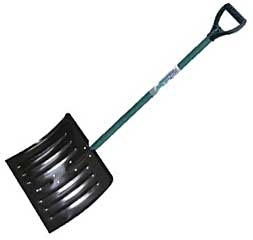 Snow shovel, 24 inch steel pusher, with braces, D Grip, wood handle, Arctic Blast, blade size 10in x 24in. 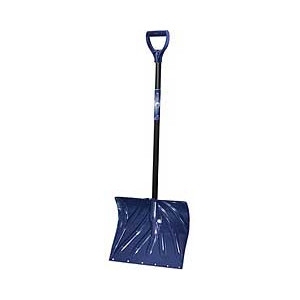 Snow shovel 18 inch steel, wood handle, D Grip, Arctic Blast, blade size 14-1/2in x 18in. Avalanche pro poly combo blade with wearstrip, alunimum handle. This poly pusher is 19 3/4 inches x 11 1/4 inches x 3 1/4 inches deep. It is sturdy and curved to throw the snow forward. The hardwood handle is 1-1/8 inches x 48 inches. It is light and really throws the snow! Comes with a 10-year manufacturer warranty. 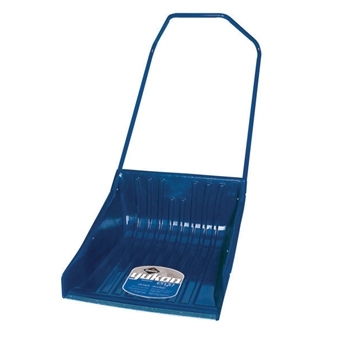 Made with ergonomic, lightweight aluminum handles. The galvanized steel wearstrip is molded into the leading edge of the blade for extra durability and strength. There are no rivets to loosen up or wear off. The blade is 19 3/4 inches x 13 1/2 inches x 5 inches deep. Our trademarked Back-Saver aluminum handle is ergonomically designed to lift the load efficiently without adding the extra weight of a steel handle. It incorporates a foam grip surface for comfort. Comes with a 10 year limited manufacturer warranty. Poly snow pusher, d-grip handle, steel-core handle, and resin gripper sleeve. 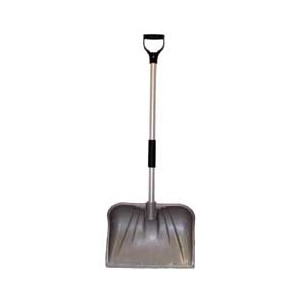 Bigfoot Snow dozer / snow shovel has a 13.5 in x 18 in. 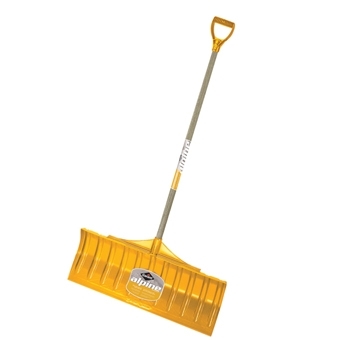 blade, a shovel, pusher, and scoop built into one super snow-removal tool. D-grip handle, lightweight, resists sticking snow, new and improved snowgrader reinforced rib design. Poly-propylene d-handle with a no break additive. 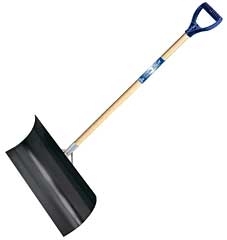 Blade size is 11 7/8 inches X 10 1/4 inches X 2 inches deep so it will hold snow. Overall length is 36 1/2 inches. 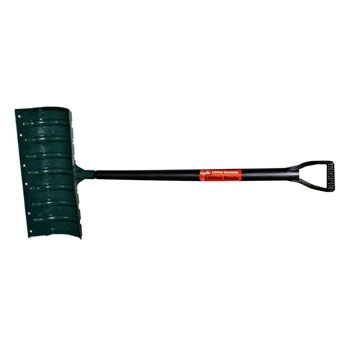 It is sturdy and has a 24 inch hardwood handle with a poly d-grip. 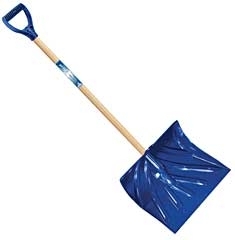 It is sturdy enough to double as an emergency car shovel. Comes with a 10 year limited manufacturer warranty. 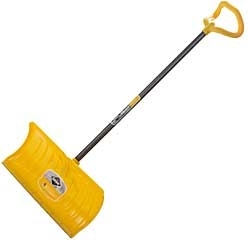 Alpine pusher snow shovel with poly blade 26. Steel wear strip extends the blade life, strong moisture resistant stained ash handle with wide Versa poly D handle which accommodates multiple glove positions for superior ergonomics and comfort. 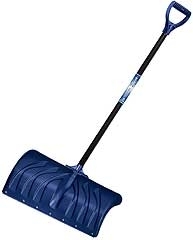 Nordic 26 poly snow pusher 26 x 11, without wear strip, strong 1 1/4 moisture resistant stained ash handle with wide ribbed poly D handle. 26 Inch Steel Handle. 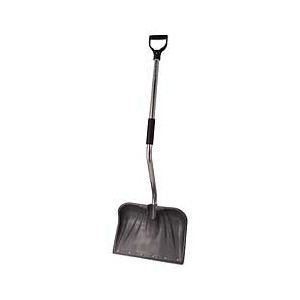 Ergo sleigh shovel, poly scoop with steel wear strip, ergonomic steel handle with grey baked enamel finish. 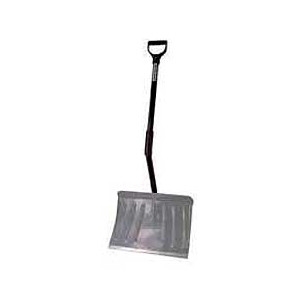 This snow pusher / snow shovel features metal handle and extra large cushion d-grip. 11.5 inch x 25 inch x 3 inch blade.